To contain these costs, policymakers have begun transitioning some of the state’s various defined-benefit retirement systems to defined-contribution plans. [†] An exception to this reform, however, has been MPSERS, which is the state government’s largest pension plan. As of Sept. 30, 2010, the MPSERS pension plan had total actuarial accrued liabilities of $60.9 billion and an actuarial value of assets of $43.3 billion, leaving an unfunded actuarial accrued liability of $17.6 billion. Reforming MPSERS by shifting new employees from a defined-benefit plan to a defined-contribution plan would further benchmark the state’s retirement systems to private-sector norms. Yet the state has also been warned by several analysts that this reform would result in substantial “transition costs” the state cannot afford. It might seem that the state can neither keep its system nor reform it — or to paraphrase Jefferson, that the state has a wolf by the ear and can neither hold him nor safely let him go. In 1996, the state created a defined-contribution plan for all new hires who entered the MSERS retirement system. The MSERS defined-benefit plan was closed to new participants, though existing participants were free to remain in the defined-benefit plan and continue earning benefits there if they chose. The Legislature instituted a similar transition to defined-contribution plans for new hires in its retirement systems for judges and legislative employees. In the defined-contribution plans for the three systems, the state employer automatically deposits an amount equal to 4 percent of an employee’s salary into an independent account and then matches an employee’s personal contributions to the account up to 3 percent of the employee’s salary. The individual employee is responsible for determining how much money is placed in his or her account, how this money is invested[¶] and how this money is used upon his or her retirement. The state does not guarantee a particular retirement income or incur liabilities for future payments. These defined-contribution systems offer three major benefits to employers. First, the plan is “current,” meaning that the costs for retirement are paid in full on an annual basis and the employer does not risk having to contribute more money in the future for unfunded liabilities. Under a defined-contribution plan, costs are incurred immediately and payment of that cost retires the employer obligation completely. In contrast, under a defined-benefit plan, employer payments are only deposits set aside to pay a future liability. These deposits may prove insufficient, so that further deposits become necessary to cover the unfunded liabilities that develop. Unfunded liabilities in a defined-benefit plan may emerge for several reasons: investment returns that are lower than the initial predictions; demographic patterns, such as member longevity, that diverge from initial expectations; or future pay and benefit changes. Second, the plan is predictable, meaning that the employer’s costs fluctuate only with payroll and with the program’s design parameters, both of which are under the employer’s control. The employer’s contributions to the plan are not subject to factors like problematic investment returns or demographics — the less predictable elements that influence employer pension contributions in defined-benefit plans. Third, benefits in a defined-contribution system are usually affordable. Private-sector employers’ payments to defined-contribution plans are usually between 5 percent to 7 percent of payroll, as noted by actuary and Mackinac Center Adjunct Scholar Richard C. Dreyfuss. MSERS defined-contribution plan, which requires state government deposits of up to 7 percent of employee payroll, is consistent with this general private-sector range. This unfunded liability suggests that the Legislature should consider repeating its successful MSERS reform with MPSERS, transitioning all new school hires to a defined-contribution plan. 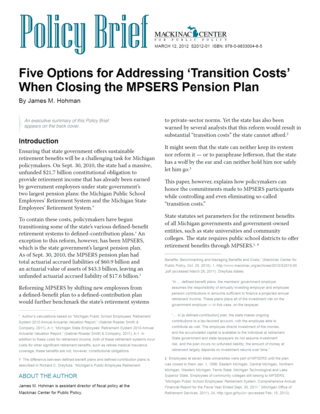 In this transition, the MPSERS defined-benefit plan would be closed to new participants, so that they would not increase the plan’s total liabilities and the potential for unfunded liabilities. The MPSERS defined-benefit plan would stop incurring further liabilities with each new hire, making it easier for legislators to finance the unfunded liabilities owed to current employees. And indeed, as discussed below, the current liabilities in the MPSERS defined-benefit plan are owed to employees under the Michigan Constitution. This does not mean, however, that reforms cannot legally be made to retirement benefits. In fact, such reforms can ensure that the constitutional promises are kept. [*] Author’s calculations based on “Michigan Public School Employees’ Retirement System 2010 Annual Actuarial Valuation Report,” (Gabriel Roeder Smith & Company, 2011), A-1; “Michigan State Employees’ Retirement System 2010 Annual Actuarial Valuation Report,” (Gabriel Roeder Smith & Company, 2011), A-1. In addition to these costs for retirement income, both of these retirement systems incur costs for other significant retirement benefits, such as retiree medical insurance coverage; these benefits are not, however, constitutional obligations. “In … defined-benefit plans, the members’ government employer assumes the responsibility of annually investing employer and employee pension contributions in amounts sufficient to finance a projected annual retirement income. These plans place all of the investment risk on the government employer — in this case, on the taxpayer. [‡] Employees at seven state universities were part of MPSERS until the plan was closed to them Jan. 1, 1996: Eastern Michigan, Central Michigan, Northern Michigan, Western Michigan, Ferris State, Michigan Technological and Lake Superior State. Employees of community colleges still belong to MPSERS. “Michigan Public School Employees’ Retirement System: Comprehensive Annual Financial Report for the Fiscal Year Ended Sept. 30, 2011,” (Michigan Office of Retirement Services, 2011), 24, http://goo.gl/hyUcr (accessed Feb. 15, 2012). [§] While there are myriad local government retirement systems, the Michigan Municipal Employees’ Retirement System covers 750 local governments and local government entities, such as regional transit authorities. MERS was created by state law, and it is now an independent nonprofit entity. “About MERS,” (Municipal Employees’ Retirement System, 2012), http://goo.gl/4yPnO (accessed March 4, 2012). [¶] Specifically, the employee is free to choose among investment options offered by an investment firm that has been approved by the state. [**] In order to keep the actuarial value of MPSERS pension fund somewhat stable compared to market fluctuations, the state uses a five-year average of the plan’s market value. In 2007, the state marked up the plan’s actuarial value to that year’s market value and began a new five-year averaging process going forward from that point. According to the most recent investment report from the Michigan Department of Treasury, the market value of MPSERS portfolio was $37.8 billion on Nov. 30, 2011 — somewhat less than the five-year average. “State of Michigan Retirement Systems Profile — November 2011,” (Michigan Department of Treasury, Bureau of Investments, 2011), http://goo.gl/IhBf0 (accessed Feb. 8, 2012).